The Paralympic Movement: A Small Number of Behemoths Overwhelming a Large Number of Also-Rans—A Pyramid Built on Quicksand? Despite the extraordinary growth of the Paralympic Games since its inception, the movement is constrained by a series of inherent weaknesses. 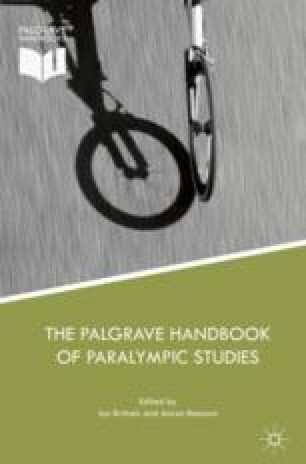 This chapter examines those structural issues that contribute towards these weaknesses through examining the management information systems of the International Paralympic Committee (IPC) and analysing these through the critical lenses of disability studies, critical management studies and human rights. These issues include the underrepresentation of some countries, gender bias and a split between the resource-rich and resource-poor regions. The analysis raises questions about equity between nations, the notion of fair competition and access to technical expertise amongst other areas of disparity. This chapter reviews these issues and identifies the role that disability classification and resource access can play in this disparity. The relationship between disability and poverty is clearly identified through the World Health Organisation’s statistics with those in research-rich nations, or the behemoths of the Paralympics, clearly at a distinct advantage for the iconic sporting event. It is suggested that the Paralympic movement needs to acknowledge these disparities and seek to redress them through mechanisms like the millennium development goals. The IPC needs to do more to create a more level international sporting playing field for athletes with disability. Braye, S., T. Gibbons, and K. Dixon. 2013b. Disability ‘Rights’ or ‘Wrongs’? The Claims of the International Paralympic Committee, the London 2012 Paralympics and Disability Rights in the UK. Sociological Research Online 18 (3). https://doi.org/10.5153/sro.3118. Brittain, Ian, and Aaron Beacom. 2016. Leveraging the London 2012 Paralympic Games: What Legacy for Disabled People? Journal of Sport & Social Issues. https://doi.org/10.1177/0193723516655580. Brouwers, J., P. Sotiriadou, and V. De Bosscher. 2015. Sport-Specific Policies and Factors That Influence International Success: The Case of Tennis. Sport Management Review. https://doi.org/10.1016/j.smr.2014.10.003. ———. 2007b. www.paralympic.org. Accessed 3 December 2007. ———. 2012. Nick Parr: Intellectually Disabled Athletes Will Benefit from 2012. International Paralympic Committee. Last Modified 12 January. http://www.paralympic.org/IPC/Documentation_. Accessed 8 February 2012. ———. 2015a. The IPC—Who Are We. http://www.paralympic.org/the-ipc/about-us. Accessed 18 August 2015. ———. 2015b. Tokyo 1964: Developing One of the World’s Best Public Transport Systems. [Webpage]. International Paralympic committee. http://www.paralympic.org/news/tokyo-1964-developing-one-world-s-best-transport-systems#!prettyPhoto. Accessed 18 August 2015. Richards, Ralph. 2015. Persons with Disability and Sport. https://secure.ausport.gov.au/clearinghouse/knowledge_base/organised_sport/sport_and_government_policy_objectives/persons_with_disability_and_sport#content. Accessed 18 August 2015. United Nations. 2012. UN Millennium Project—Commisioned by the UN Secretary General and Supported by the UN Development Group. http://www.unmillenniumproject.org/who/. Accessed 14 August. World Health Organization. 2013. Disability—Report by the Secretariat. In Geneva: World Health Organization. http://apps.who.int/gb/ebwha/pdf_files/WHA66/A66_12-en.pdf. Accessed 21 October 2013.